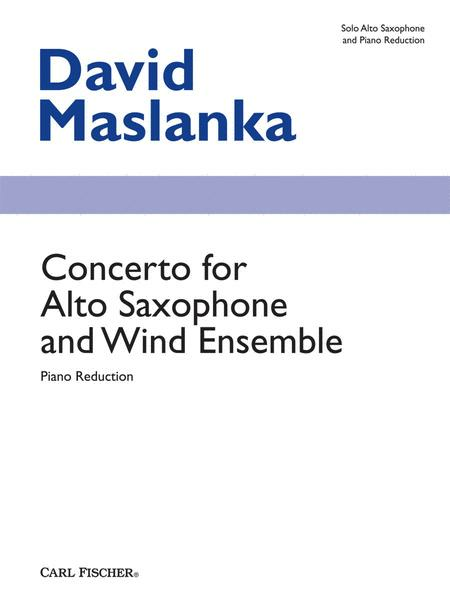 David Maslanka's concerto for alto saxophone and wind ensemble in five movements was premiered in March of 2000 by the University of Arizona Symphonic Wind Ensemble, conducted by Gregg Hanson, conductor and featuring Joseph Lulloff, solo saxophone. From the composer: ?This concerto turned out to be a good deal larger than I would reasonably want. As I got into the composing, the ideas became insistent: none of them would be left out! The format of ?Songs and Interludes? arises from my other recent works for saxophones (?Mountain Roads? for saxophone quartet and ?Song Book? for alto saxophone and marimba) and suggests a music that is more intimate than symphonic. There is a strong spiritual overtone with quotes from Bach chorales, and from my own works ?Hell's Gate? and ?Mass.? A story is hinted at which has the Crucifixion right smack in the middle ? the climax of the third movement quotes the ?Crucifixus? from the ?Mass.? I don?t know what the story is, only that it wants to be music, and not words. ?